COTONOU, Benin , Mar 21 2019 (IPS) - Elhadj Mohamed Diallo wants to make sure that others won’t experience what he has lived through. The former irregular migrant who has returned home to Guinea from a jail in North Africa is calling on his fellow returnee migrants to establish associations in their respective countries, which will serve as powerful platforms to combat irregular migration across the continent. “If I had the resources, I would tour Africa to create awareness about irregular migration. But because I haven’t got [those resources], I am urging all the African returnees wherever they are to take this fight into their hands and do something to stop the people who want to travel that route from experiencing what we went through,” he tells IPS. The resource-rich West African nation has a population of about 13 million, of which 60 percent are less than 25 years of age. But widespread corruption, poverty, the country’s low score on the Human Development Index (Guinea ranks 175 out of 189 countries on the index), coupled with political unrest, has seen hundreds of young people attempt irregular migration with the hope of finding peace and stability in Europe. The journey is a harsh one and Diallo’s own experiences of irregular migration are traumatic. In Morocco he was attacked by five youth and seriously wounded in the face and back. It, however, didn’t deter him from trying to reach Europe through irregular means. And it was only after he had been held for the third time in a Libyan jail that he eventually returned home through the European Union (EU)-International Organisation of Migration (IOM) Joint Initiative for Migrant Protection and Reintegration. The 31-year-old is one of the Guinea migrants assisted to return home by the IOM. A total of 12,609 Guinean migrants stranded in North Africa have been assisted by the EU-IOM initiative to return home from Niger, Libya, Mali and Morocco. According to IOM’s recent figures, four percent of the returnees to Guinea are women, with six percent being minors. “They are carried out by young migrants who returned from different North African countries with the support of IOM and its partners,” Mariama Bobo Sy, the spokesperson for IOM in Guinea, tells IPS about the project. 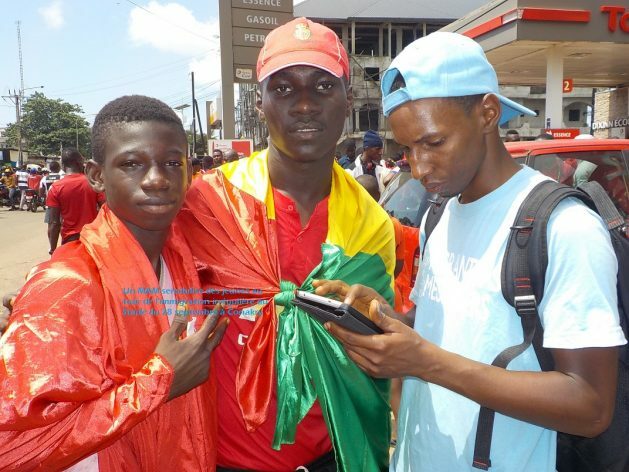 As part of the awareness campaign, returnee migrants in Guinea have participated in events at football games, music shows and even universities. “They also organised focus groups with young people in different neighbourhoods of Conakry and outside of the capital, particularly in Mamou, a crossroads town located 275 km of Conakry. Also, they were time to time in touch with the media to discuss the issue of irregular migration in a view of reaching more people, and get the message across to various sections of the population,” Sy says. The experience made Diablo realise there was a need for further action. He has gone on to found the Guinean Organisation for the Fight against Irregular Migration, known as Organisation Guinéene pour la Luttecontre la Migration Irregulière (OGLIM) in French. Apart from its headquarters in the capital Conakry, OGLIM has five national branches, namely in Kindia, Mamou, Labe, Kankan and Nzerekore. The group has currently 550 members in Conakry and 250 outside the capital. “The terrible things that we saw and experienced during our ordeal in North Africa should serve as a catalyst for teaching the young generations about the dangers of irregular migration,” Diablo explains.